They’re back again! The popular PK Education Supply Teacher of the Year Awards return for the fourth year running and we know they’re going to be bigger than ever before. Once again, we want to recognise the hard work and dedication of the supply teachers who work alongside you in schools every day. All too often they are underappreciated, but we know differently. They play a vital role in keeping our schools running and ensuring children learn. We want you to tell us which supply teachers have made and continue to make a positive difference in your school. Nominations are now open and will close on Friday 18 May 2018. You can nominate here. Nominating is simple. Just tell us the name of the supply teacher and why they stand out for you. Following the nomination process, our team will shortlist three teachers from each of our seven offices. The shortlist will then go to a vote and the public will decide who wins the prestigious Supply Teacher of the Year title for each area (West Midlands, East Midlands, West Yorkshire, South Yorkshire, North West, North East). Voting will open on Tuesday 29 May and close on Sunday 17 June 2018. Commenting on her award Anna, who is passionate about education, said: “I felt very appreciated to have been nominated, then, to go on and win was something I didn’t expect. It really was a glorious surprise. “I have four children, so teaching on a flexible contract is very important to me. I am also an explorer, constantly testing the waters in the many exciting educational environments we have in the UK, to see where I can be of most use. Supply teachers are playing an increasingly important role in schools across the country. A survey undertaken by Association of School and College Leaders (ASCL) discovered that 97% of headteachers in state-sector secondary schools have called upon agency supply teachers in the past 12 months, 66% because of difficulty in recruiting permanent staff. That’s why at PK Education we want to recognise the supply teachers who have been outstanding in their profession over the last year. Commenting on the launch of the 2018 awards, Lee Carpenter, Director of PK Education said: “We are delighted to be able to continue with what has become an important opportunity to recognise the hard work of our supply teachers for a fourth year. Supply teachers often don’t get the credit and recognition they deserve for the role they play in schools across the UK and these awards play a small but important role in acknowledging their contribution. It’s also a very public way for PK to say a big thank you for everyone’s hard work and dedication. 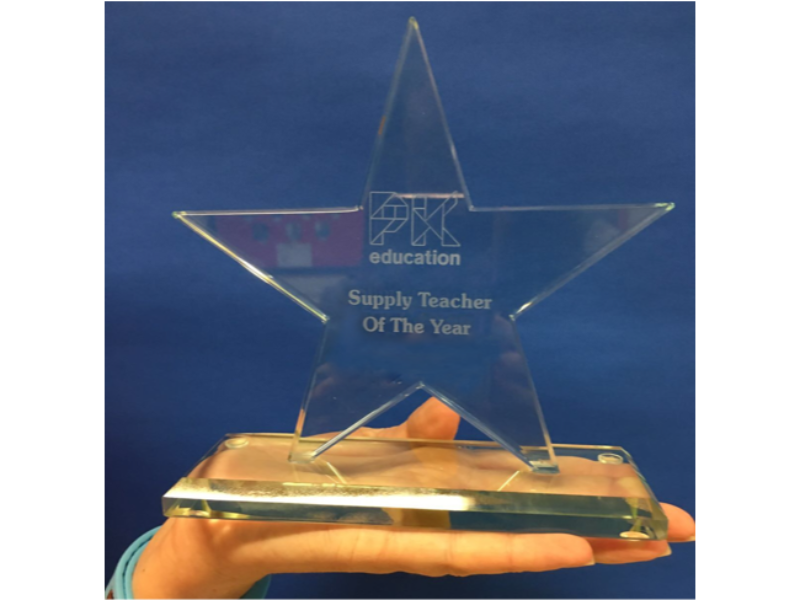 Each award-winning supply teacher will receive a stunning glass trophy and a £50 gift voucher as well as a prestigious title. If you wish to nominate your top PK supply teacher, please get in touch with us here, along with the name of the teacher and why you think they deserve the recognition and award.